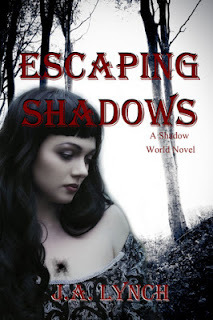 I have had escaping shadows on my tbr pile for quite some time and was pleased with the second book in this series. A little confusing at times, sometimes I wasn't quite sure what was happening because Giselle seemed to be with different 'groups' for different reasons, but overall it was a good read. Baby Kaden was so sweet, lucky for G not having to go through the entire 9 months pregnancy! I felt sorry for Giselle when she returned home to her family in search for a place of safety for her son. They were so happy and welcoming at first, but as soon as they discovered part of the truth and how much things had changed, they practically shoved the mother and child out of the door, which I thought was a little bit unrealistic. I can sense some redemption coming from Alex...Maybe there is still something good in him, although he is not setting a good example by kidnapping his son! And who is this mysterious man who Giselle believes is dead but is the leader of the vampires? Leonid?? ?